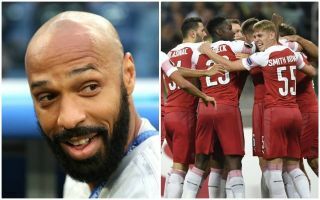 Arsenal have been quickly approached by their former player Thierry Henry over a potential loan move for youngster Emile Smith Rowe in the January transfer window. The 18-year-old has made quite an impression in the Gunners’ first-team this season, and sources at the club have told CaughtOffside that Henry has instantly got in touch about signing him after being announced as the new Monaco manager on Saturday. The Frenchman hopes to use his Arsenal connections to good effect in the transfer market as he faces the tough job of reviving a side that struggled under his predecessor Leonardo Jardim this season. However, it’s not clear at the moment if a loan for Smith Rowe is likely, with the Daily Mail reporting not so long ago that Arsenal manager Unai Emery personally vetoed him moving away on loan this summer. Early indications from Emirates Stadium sources suggest Arsenal could make an exception for a talent like Smith Rowe to play regularly and learn from a club legend like Henry. It’s also been suggested there may also be more of a push from the player himself to work with a Gunners great, whom he’ll have come across before as Henry previously had a coaching role with the Arsenal Under-18s. English youngsters moving abroad is also becoming an increasingly common theme at the moment as Jadon Sancho and Reiss Nelson have enjoyed particular success in trying their luck on foreign leagues, getting the chance to play more. Smith Rowe will no doubt have seen how this has helped Sancho get fast-tracked into the senior England set-up and may look to do something similar with a loan away from Arsenal if he doesn’t see more action in big games in the Premier League after getting the chance to impress in the Europa League this term. A big opportunity with @AS_Monaco, a club close to your heart – and we'll all be rooting for you ? CaughtOffside understands that further discussions will be held over the matter closer to January, while another similar target for Henry is Callum Hudson-Odoi of Chelsea, according to the Mail. Whether he signs any of their players or not, Arsenal fans will no doubt keep an eye on Henry’s progress at Monaco, as, being one of their best ever players, many would love to one day see him in the Emirates Stadium dugout.